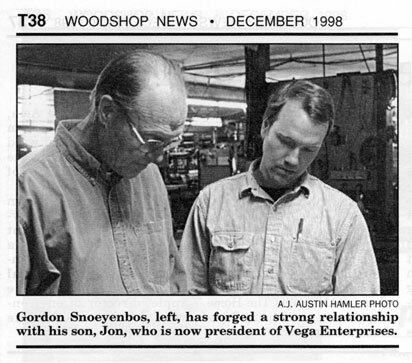 Vega was founded by my father, Gordon Snoeyenbos, in the early 1960s. Growing up on a hard-working farm in Wisconsin in the 1930s, he developed a strong interest in woodworking. Commandeering the family chicken coop for his first workshop, his skills quickly advanced and he began generating reproduction furniture. Through his accomplishments, he was able to put himself through college to earn an engineering degree. Among hi s many endeavors, he was employed at Wagner Castings in Decatur, Illinois and headed the industrial technology department at Millikin University, Decatur, designing and building several homes in the area. With his experience in ductile iron, my father designed a set of small machines to test welds. With the success of this design, production moved to a variety of technical training equipment, including hydraulic, pneumanic, electrical, engine testing, powdered metals, rotational molding, etc. During this time, his brother David founded Airfloat Corporation which manufactured air bearings used to move heavy loads over concrete floors. The two shared the same facility for several years. Vega purchased a woodworking tool company called Yates American/J. Line with the intention of building woodworking machinery mainly for the high school market; however timing was bad as school funding shifted away from woodworking. A renewed interest in the hobby/craft and custom woodworking was rapidly developing so dad looked for niche products of superior features, capacity, and functions that were unique. The conception of our distinctive line of high-quality products resulted, such as the Vega Lathe Duplicator and our top-selling Vega Pro and Utility Saw Fences. We invite you to visit our products page to see the detailed features of our unique line and to see why Vega has sold hundreds of thousands of our machines over the last 55 years. During my 30+ years at Vega, we have seen a mass exodus of the larger manufacturers to low wage/cost countries such as China and Taiwan. Their ability to mass produce at an unimaginably low cost is making it increasingly impossible to compete. Consequently, small U.S. manufacturers have to find niche products that are produced in small volume. Even with this philosophy, the costs of producing in the United States are elevated due to paying decent wages, insurance, high material costs, taxes, etc. That being said, the art of woodworking and manufacturing tools and machines is in our blood. Nothing compares to the deep satisfaction of taking beautiful hardwood and shaping it into a beautifully functional piece using thoughtfully designed equipment. All of us at Vega are committed to building the best tools for the serious woodworker. We strive for complete customer satisfaction in all aspects of our business – design, manufacturing, delivery, and customer service after the sale. We thank all of our customers – past, present, and future – and invite you to have a look at what we offer…thoughtfully designed machinery, made in the USA.